We are a family with a teenager and a tween that spends a lot of time traveling for sports and leisure. Of course, we all have our phones and electronics in the vehicle with us and it never fails... more than one usually needs to be charged at the same time! 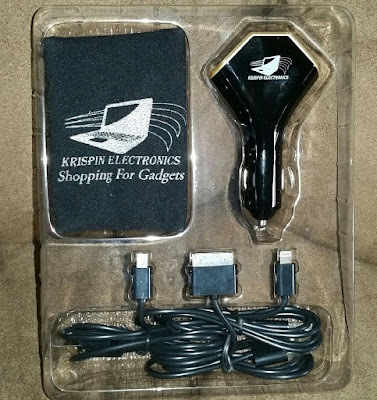 I was recently sent a TripleBooster Car Cell Phone Charger for review. It conveniently comes with 3 USB cables for the iPhone 4/5/6, Android, PSP,Camera, etc... making it the perfect travel accessory for our family! In addition to charging really quickly, it has has 3 ports so you can charge 3 electronics at once which is great when you are traveling! I also love the cloth bag it came with. It makes it easy to store the cables in while they are not being used so they don't get lost! The TripleBooster includes a powerful 3 USB ports charger 7.2A 36W, A Micro-USB Cable for Android users, A 30-pin (dock) USB Cable for iPhone 4 users, A 8-Pin (Lightning) USB Cable for iPhone 6 users, and a cloth bag to store all accessories. ALL CABLES ARE 1m LONG, AND ARE RATED FOR 2.4A ! The TripleBooster is ideal for frequent travelers who use multiple devices. By using the 3 USB outputs with 36W / 7.2A, it enables you to charge practically any of your mobile 5V based devices simultaneously & rapidly. 3 devices at a time. This is an advanced car charger, that includes built-in Over charge Protection, over discharge protection, short-circuit protection, stable voltage protection, Over-current protection, over heating protection etc. The charger also senses the attached device, and delivers the max. power allowed for it. It is also CE / FCC / RoHS and ISO 9001 certified. 3 LED power indicators (One for each USB port) let you know which port or device is currently charging. The LED indicators are easy to see but soft enough so they do not distract you while driving. When the phone battery is full - the charger stops its work, and the LED indicator turns off. The TripleBooster Car Charger is made of a Fire-Resistance, durable and lightweight material. This will provide you years of easy, safe, and enjoyable use. So, Click on the 'Add To Cart' button now, and enjoy 18 months guarantee, and lifetime support! - The TripleBooster Charger: Durable, Powerful and safe for use. - A Micro-USB cable: 1m long, rated for 2.4A, For Android 5V based phones and tablets. - A 30-Pin USB cable: 1m long, rated for 2.4A, For iPhone 4, or any 5V based product that use this connector. - A 8-Pin USB cable: 1m long, rated for 2.4A, For iPhone 6, or any 5V based product that use this connector. - A welcome guide that includes the TripleBooster site address. As a VIP member, you are entitle to bonuses from time to time. - A cloth bag to store the cables in, when they are not in use. - A User-Guide with simple instructions on how to operate the TripleBooster. The TripleBooster is great because it comes with car chargers for a variety different phones. This car charger has been a lifesaver! I really need a charger like this one. I like that it has 3 USB cables.